If you’re avoiding red meat because of the bad press on saturated fats, you’ll be happy to know that grass-fed beef is low in saturated fats and higher in healthy fats. Here’s the low-down. The human body does not produce its own omega-3 fatty acid. This has to be obtained from the diet. Over the past 150 years, intakes of omega-6 have increased and intakes of omega-3 have decreased in parallel with the increase in heart disease (EUFIC Review, 2015). From this the concept of an ‘ideal’ ratio of omega-6 to omega-3 fatty acids in the diet was developed. The ideal ratio of omega 3 and 6 fatty acids is one to one. Grain-based foods, nuts, most seeds, and many fruits are deficient in Omega-3, compared to omega 6. The imbalance of omega 6, outweighing omega 3 in cell membranes leads to body failures (aka chronic diseases). All chronic diseases can be traced to eating grain-based foods and grain-fed livestock products. Over 2000 scientific studies have demonstrated that there are a wide range of problems associated with omega-3 deficiencies, including: dyslexia, depression and violence, allergies and eczema, memory problems, inflammatory diseases, diabetes. Grass-fed beef has 1/3 less Omega 6 than grain-fed beef and 12 times more Omega 3. CLA also needs to be obtained from the diet as the body does not make it on its own. CLA helps to combat cancer, asthma, cardiovascular disease, high blood pressure, high cholesterol and triglycerides, insulin resistance, inflammation, immune system invaders, food-induced allergic reactions, and osteoporosis. Research on humans has shown that CLA is beneficial in reducing body fat, and increasing lean body mass. In other words, CLA reduces fat while preserving muscle tissue, and it may also increase your metabolic rate. 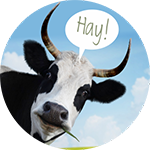 Some of the best sources of CLA are grass-fed beef and raw dairy products that come from grass-fed cattle. Vitamin A is a fat soluble vitamin and a powerful antioxidant. It plays an imperative role in maintaining healthy vision, neurological function, healthy skin, strong bones, gene regulation, healthy cell growth, neutralizing free radicals, and supporting immune function. There are 2 types of Vitamin A: Retinol and beta-carotene. Retinol that comes from animal-derived foods and which the body can use directly; and beta-carotene that comes from colourful fruit and veg, which is then converted to retinol in the body. It is always better to get your Vitamin A intake from natural food sources instead of overloading on supplements. Grass-fed beef has 5 x the amount of Retinol, and double the amount of beta-carotene than grain-fed beef. This is the collective term for a group of fat-soluble compounds having distinctive anti-oxidant activities. The body forms free-radicals when it converts food to energy and is exposed to them from the environment. Anti-oxidants protect cells from the damaging effects of free radicals which damage cells and might contribute to the development of cardiovascular disease and cancer. Vitamin E is involved in immune function, cell signaling, regulation of gene expression, and other metabolic processes. It is also said to block the formation of carcinogenic nitrosamines formed in the stomach, and protect against cancer by enhancing immune function, and to play a part in protection from Alzheimer’s disease. Grass-fed beef has 5 x the amount of Vitamin E than grain-fed beef.